How often do you check online reviews before you finally decide on a business? With the Yellow Pages no longer being prevalent today, customers are turning to the Internet to conduct local online searches for businesses. This is when customer reviews can either make or break a business. Five star businesses are ideal, but if a business has no reviews, it can be just as bad as having negative reviews. The biggest challenge is having customers who are pleased with a business to leave positive reviews. Unhappy customers are motivated to leave negative reviews, while happy customers stay silent. 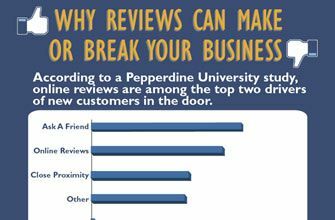 To further prove how important online reviews are to a business, Pepperdine’s Graziadio School of Business and Management conducted a study of online reviews in summer 2012. We turned the study into a helpful infographic, Why Reviews Can Make or Break Your Business, where you can see the vital role that online reviews play in influencing customers.